Like many of us, you may be thinking of jobs you can do in the garden over the coming Easter weekend. It’s traditionally a time when us Brits crack on with some DIY, and lots of us like to take that outside, sprucing up the garden after a long and dreary Winter. If yours is anything like mine, it really needs some tidying, the lawn mowing and an injection of colour. The Easter weekend is a great time to get the whole family outdoors and working on the garden together. So what might you be tackling in your garden this Easter? Here are some ideas to give you some inspiration to get out there and get it done. There’s nothing like the sound of running water in the garden, to soothe and calm you. Imagine sitting on the lounger in the warm summer sun, reading your book and sipping your beer, and listening to the gentle trickle from your newly installed water feature. Check out an online store like Swell UK to give you both inspiration and the products to create something really special. It’s not something you might think of immediately, but taking our indoor loves out into the garden is a great way to create synergy between the two spaces. 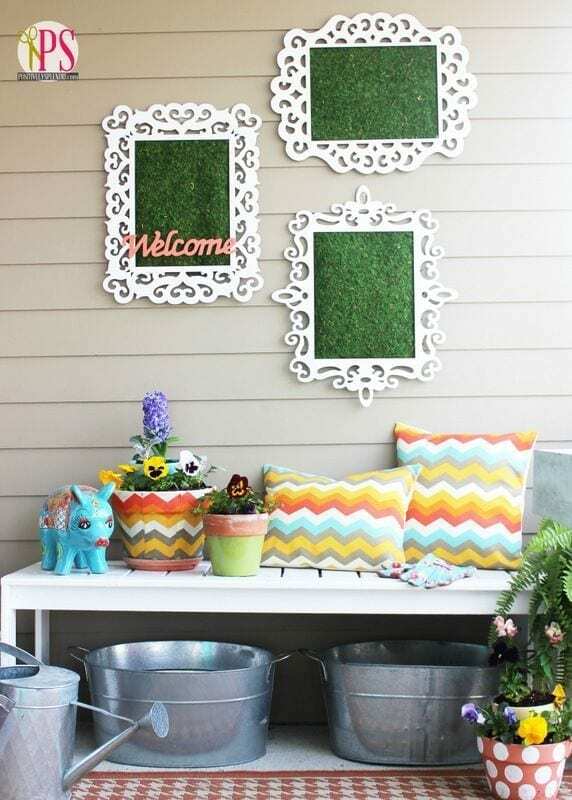 I love this idea of creating some moss filled wall art, over a cute seating area. I also love how they geometric pattern from the cushions has been carried through onto the pot plant using some very natural and organic hues. 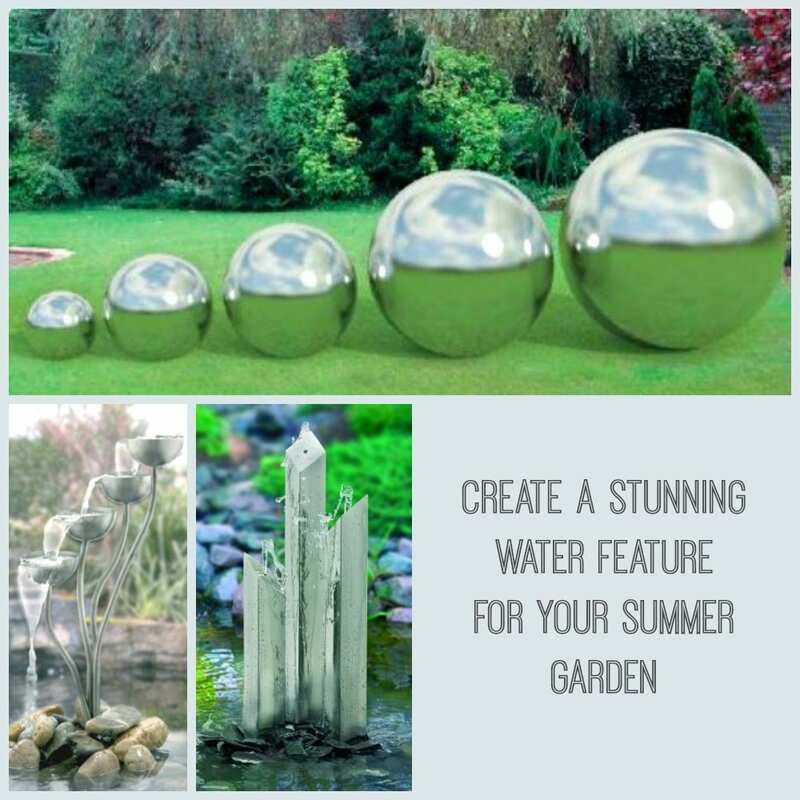 Is this something you would love to create in your garden? We did this little project last summer but I thought it was worth revisiting for this post. It’s still up in the garden and looking great after a wet and soggy Winter, so at least I know the paint will stand the test of time. 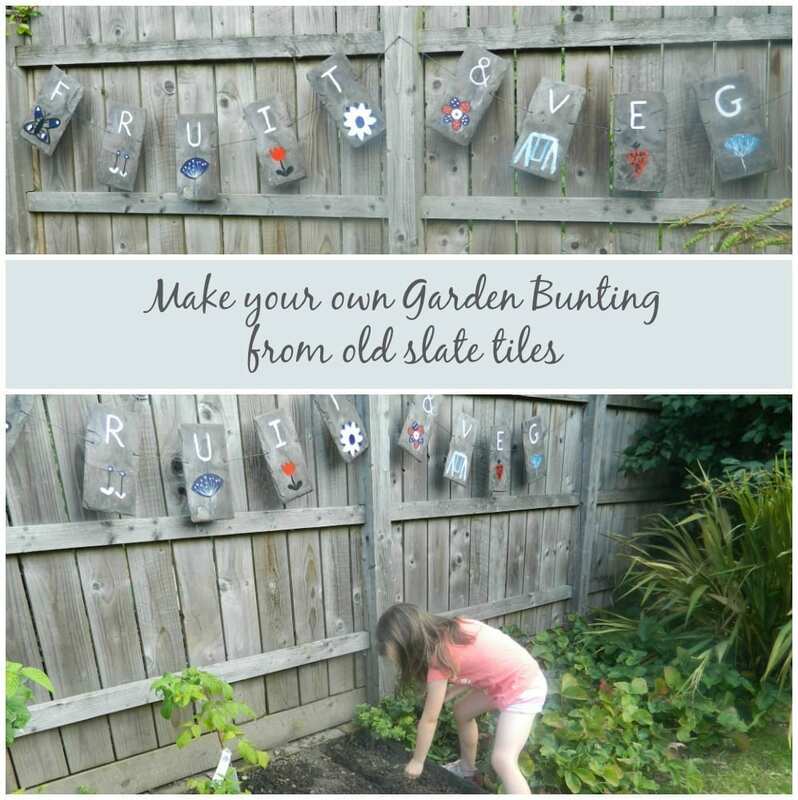 We used some old slate tiles that were lurking at the bottom of the garden, painted them using acrylic paints and hung them with garden wire. Now all we need to do this Spring is plant up the veg patch again ready for the summer. It might look like this is just a step too far for a weekend project. But if you check out the tutorial over on Modernly Wed, you’ll find it’s really rather simple. I love the way she’s added the neon yellow colouring and stacked them in this offset way, creating something really unusual, and very on trend. Ideal for a herb garden outside your back door, or as planters on an apartment balcony, these versatile, fashionable planters will have people talking for ages! Now you could by these from Etsy, or you could make something very similar yourself. Lighting is a great way to create the right mood in a space, whether indoors or outdoors, and using hanging mason jars like this adds decoration too. Dot these around your seating area or up and down the garden to light the way. 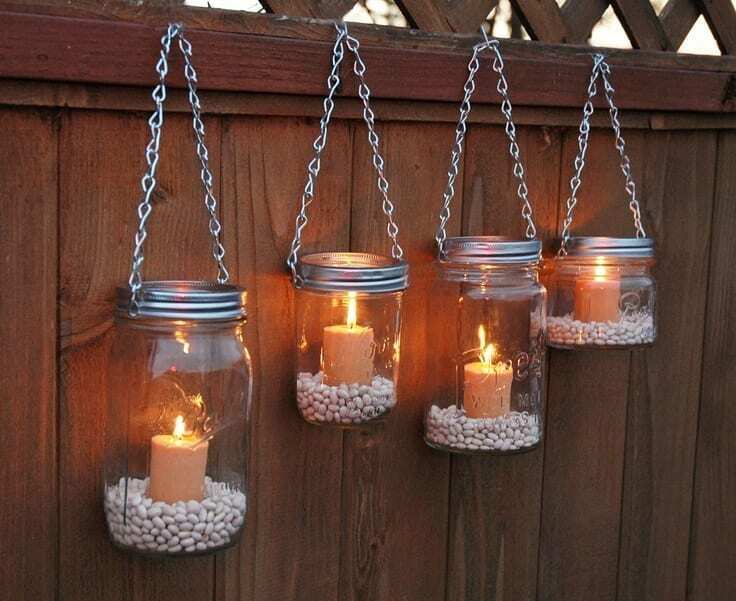 Add fresh candles when the old ones are done, and you will have lovely lighting for your garden for the whole summer. 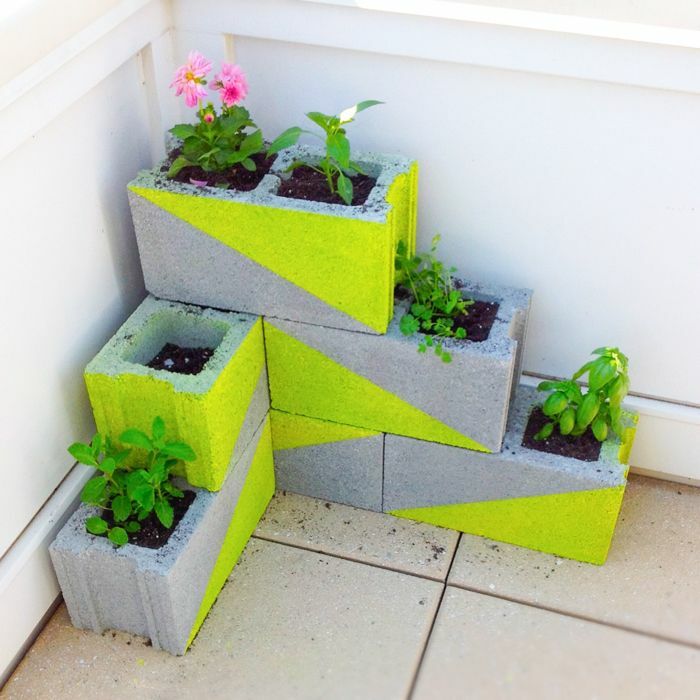 Are you inspired to have a go at some DIY garden projects this Easter weekend? Gorgeous ideas! My wife and I plan to build a 2-storey cabin for our kids and that DIY candle light just made it to our lightings! Checking Etsy now for mason jars. Fabulous ideas! Will be trying a few of these for myself! Thanks. I love all the choices you have made especially the DIY outdoor lighting. I hope you get your garden finished in time! Good luck!